Approximately 12-1/4 inches / 31 cm wide. 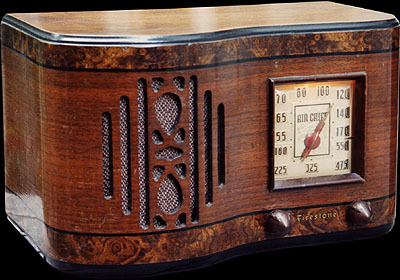 In addition to supplying it to Firestone, Stewart-Warner also sold this radio under its own brand name and model number, 13-5U2. (It's listed as model 5U2 on page 287 of Stein's Machine Age to Jet Age II.) The marketing requirements of the two companies' sales departments were different: The Firestone has a six-tube chassis with an RF amplifier stage, while the Stewart-Warner has a lower cost five-tube circuit.